How can we understand information flows between organizations and Syrian refugees living in Jordan and amongst refugees themselves? Contracted by the International Rescue Committee (the IRC) and UNHCR. Remember a time when you had a question and couldn’t find the answer to it anywhere? Now imagine you’re a refugee, living in displacement in a vulnerable state, not knowing what the future will offer. How would you seek information and try to get answers to your most pressing questions then? In an effort to understand how best to support Syrian refugees with information in order to be more resilient, the IRC and UNHCR launched a research study to identify and assess the various communication flows between refugees and humanitarian organizations and amongst refugees themselves. The research mapped out the existing communication channels, the types of information being provided, received and shared, and the efficacy of these channels in reaching the right people with needed information. The goal of the study was to seek ways to support the humanitarian sector in maximizing the reach and impact of information provision activities. I was contracted to conduct a Design Research to understand the information flow specifically from the refugees’ point of view. 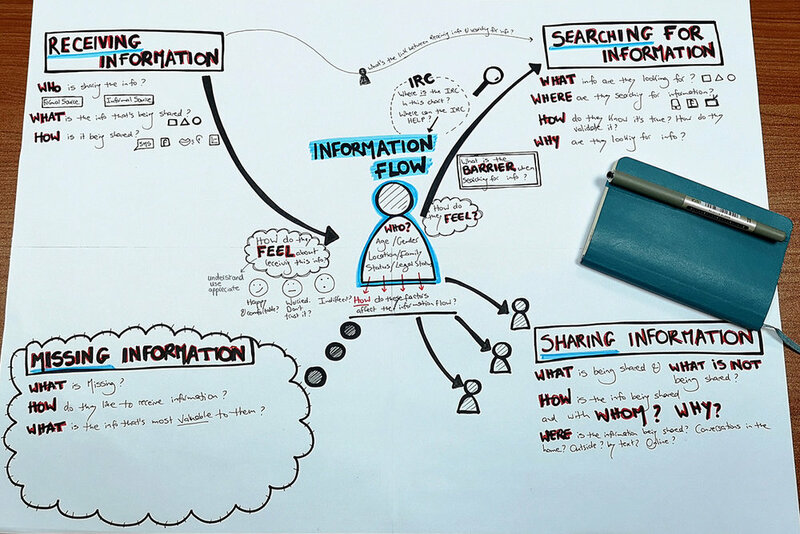 What are the different ways of information seeking amongst affected populations? 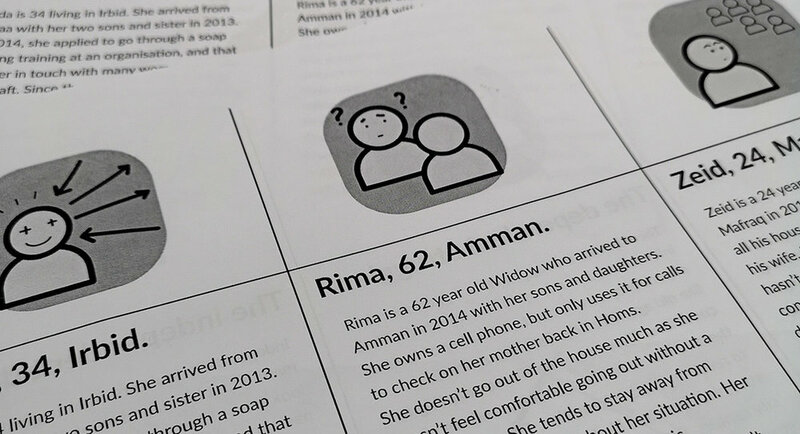 How does information travel between refugees? What are the most trusted sources of information? How can those insights inform how organizations communicate with communities? In-depth interviews with 67 beneficiaries in Amman, Mafraq, Ramtha, Irbid, Jarash and Karak. 10 Group discussions with 6-15 participants each, in Amman, Mafraq and Irbid. Key informant interviews with 12 representatives from organizations. The thriving networkers. They’re well connected in their neighborhoods and verbal about their needs. The dependents strugglers. They heavily depend on someone else for information. The independent doubters. While preferring to acquire information independently, they don’t trust most sources and especially organizations. Keeping our three archetypes at the core of our study, we developed an early stage diagram of the research questions that we want to cover through our interviews and our observations. What are the barriers for the thriving networkers, the dependent strugglers and the independent doubters to receive information, and seek information? What are types of information that they need but can’t find anywhere? There are multiple informal channels currently used by refugees, but between refugees and organizations channels are primarily uni-directional. Validating information and being able to separate rumors from fact is a time-consuming and frustrating process. Safety (both in Jordan and in Syria) was consistently prioritized as the number one concern for refugees, across age, gender and location. the most trusted ways is to ask people who stayed in Syria or have recently returned, or drivers on the road. Facebook and WhatsApp are helpful because they enable speedy access to answers, and a large number of responses. “Facebook goes where TV can’t”. Live videos allows refugees to have eyes and ears on the ground. However, refugees are aware of the growing number of fake accounts and rumors spreading widely on social media. They know information is being monitored and they are being observed on public pages. The Durable Solutions working group is made out of 30 organizations who meet monthly to put in place policies for a better response to durable solutions for refugees in Jordan. We had the incredible chance to present our main findings from our research to the team, and followed up with a workshop. We started by presenting Rima (thriving networker), Hoda (dependent struggler) and Zeid (independent doubter), our three personas. Using customer journey maps as a baseline to our conversations, we asked three different groups to map out the communication channels they already use, and finding innovative ways to make them more two-directional.